This chap is Craig Cunningham who had his comic collection Ruined and popular Inkbots card prints. This excitable lady is Ell Walker. 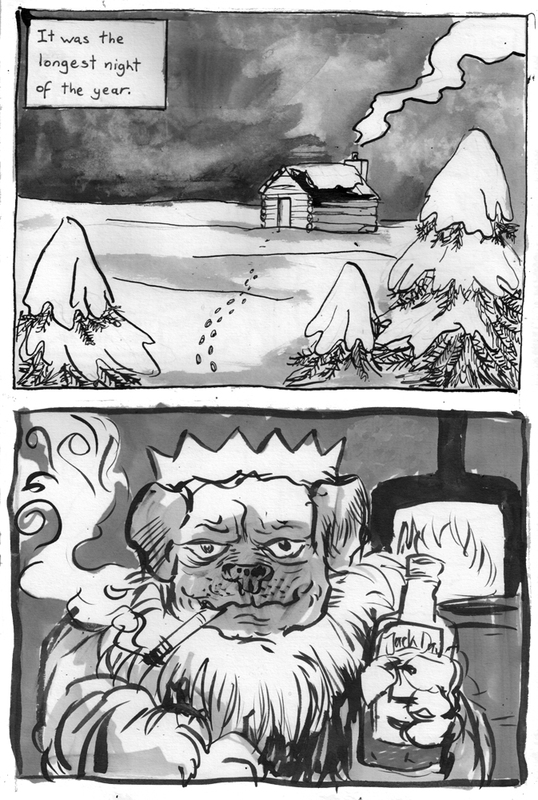 She had her various comics including Beast in the Woods and her art prints. Claire Hubbard was also there with her table of goodies. In there are her comic The Cats that Stared and the anthology she edited Video Games for Good. 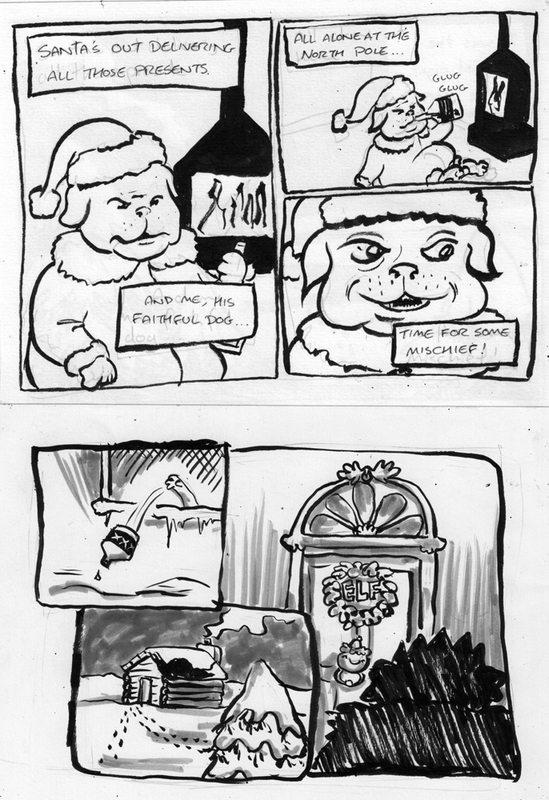 Zu Dominiak had her 24 hour comic The Orb available among a plethora of other comics. Zu and Claire evaded the cameras around their tables, however they were caught posing later on. 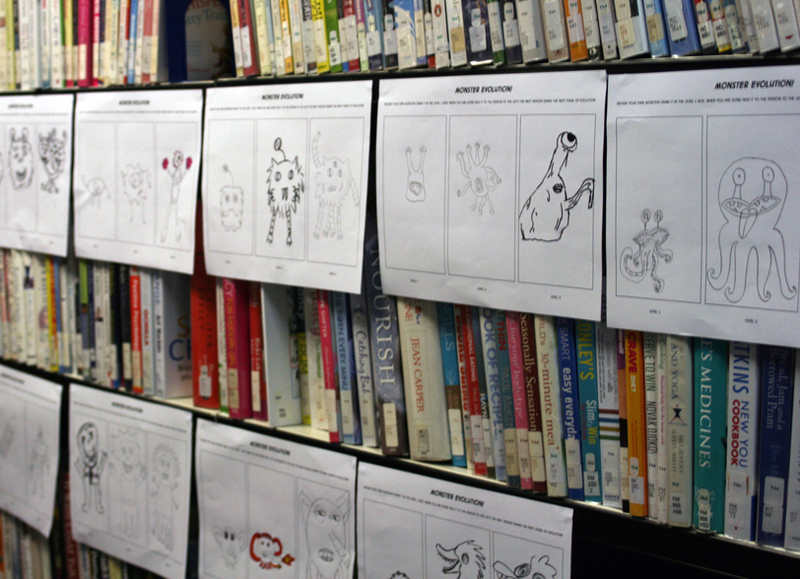 Hari Conner was displaying her colourful art including the comics Bernie the Demon and the almost (almost!) finished series Nyx in the Overworld. Steven Ingram was there debuting the final part of his comic Left. Here he’s holding up the series in a thoroughly normal manner. Also around was Luke Surl with his Suit-Up! playing cards. Apart from sneaking in the background of this pic he somehow avoided the cameras though. A great, bubble tea fueled, day was had by all. Thanks to Little Shop of Heroes for putting on such a good event! 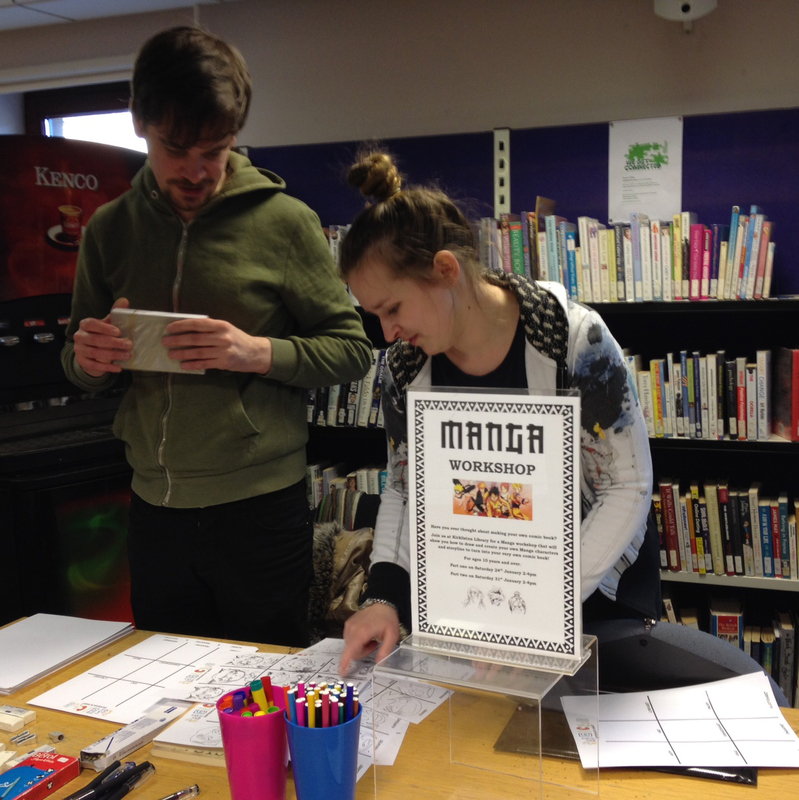 Recently we were invited by Kirkliston library to run a Manga Workshop! 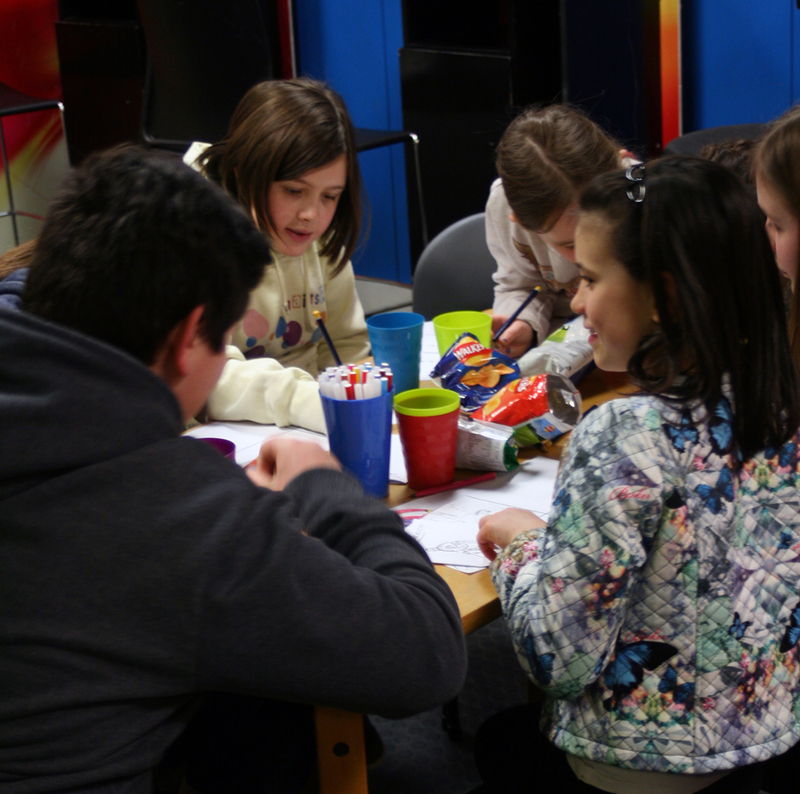 The event was held over two consecutive Saturdays this January, and was aimed at young people aged 10+. We started everybody off on day one with some character creation and development exercises, including the fearsome expressions sheet! How do you draw a smug ninja? It’s the ultimate challenge, but everyone really had fun with it and did a great job. 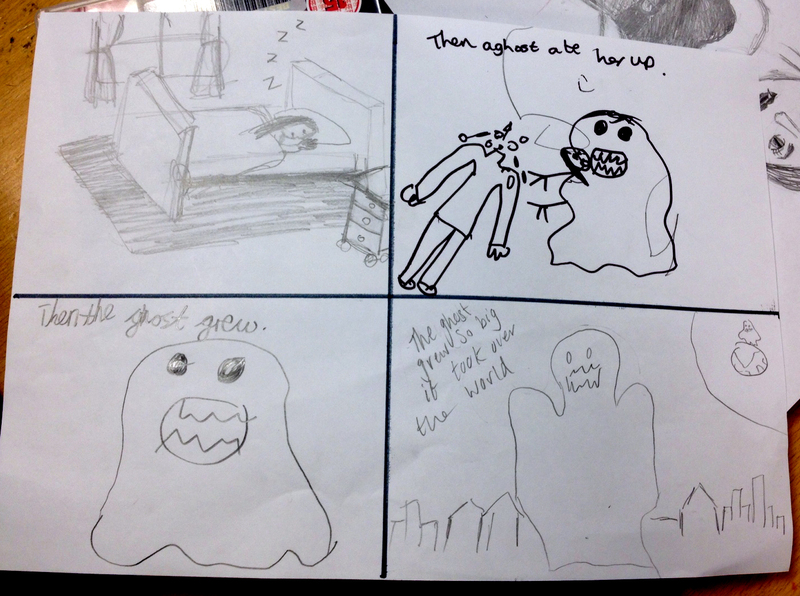 Then we moved on to a collaborative comic creation game – everybody drew one panel of a manga, then passed it on to the next person who continued the story (and so on). Everybody really seemed to have fun with this one! We were really pleased with how the first day went, so we were looking forward to coming back the next week and doing some more work with the participants on their own ideas. 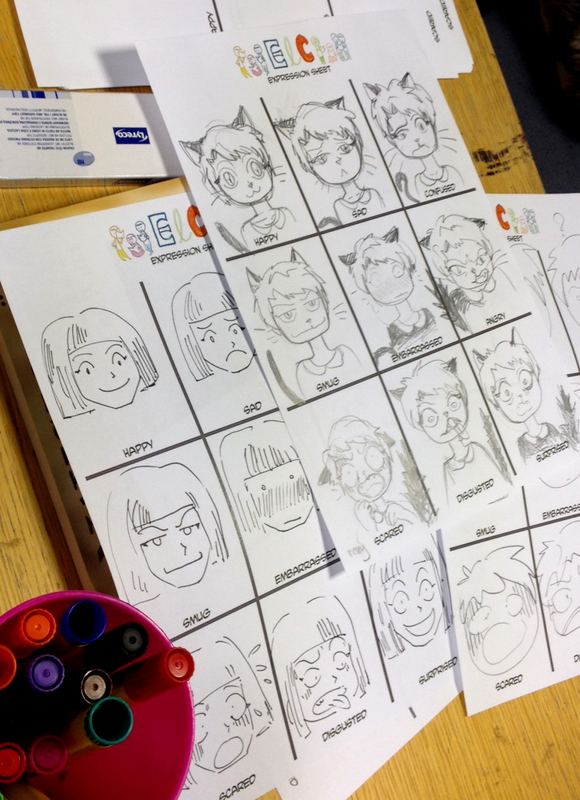 We gave some of the older people in the group a bit of homework – to come up with a character and a rough story for their own manga! 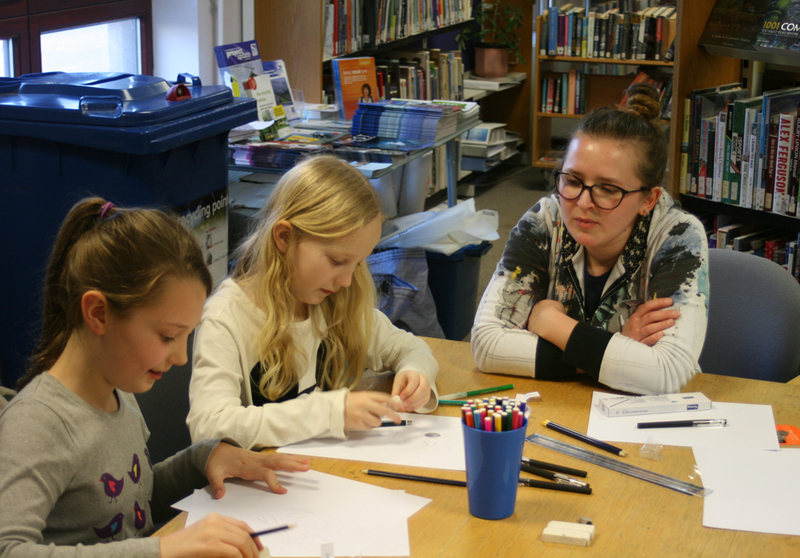 We weren’t sure if anyone was going to take us up on the exciting offer of extra homework, so we planned lots of activities for the second Saturday just in case. We needn’t have worried! 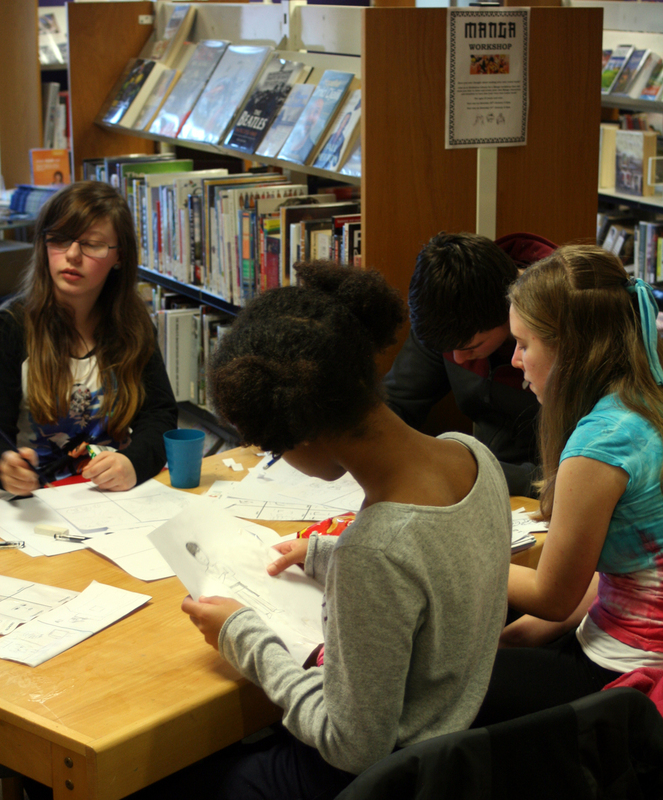 All of the young people were really enthusiastic and came up with some brilliant ideas, which we helped them to develop. 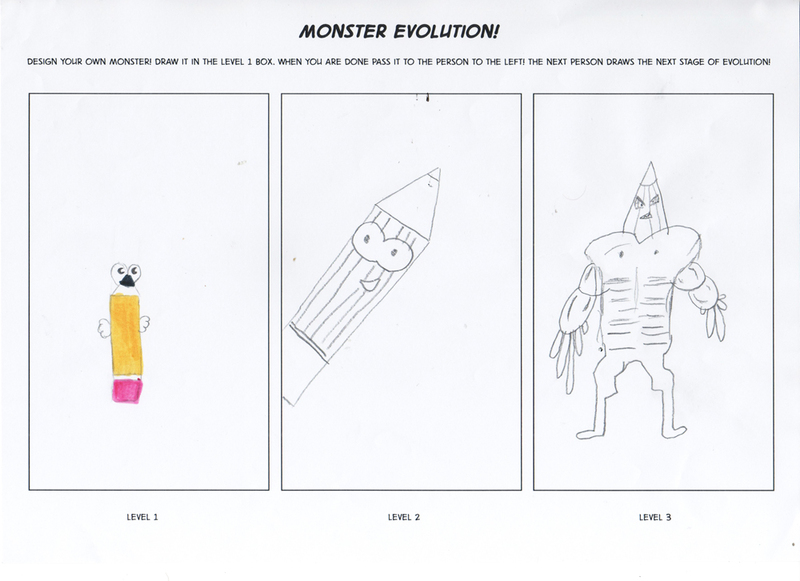 We did play a few rounds of my favourite game anyway, though – Monster Evolution! 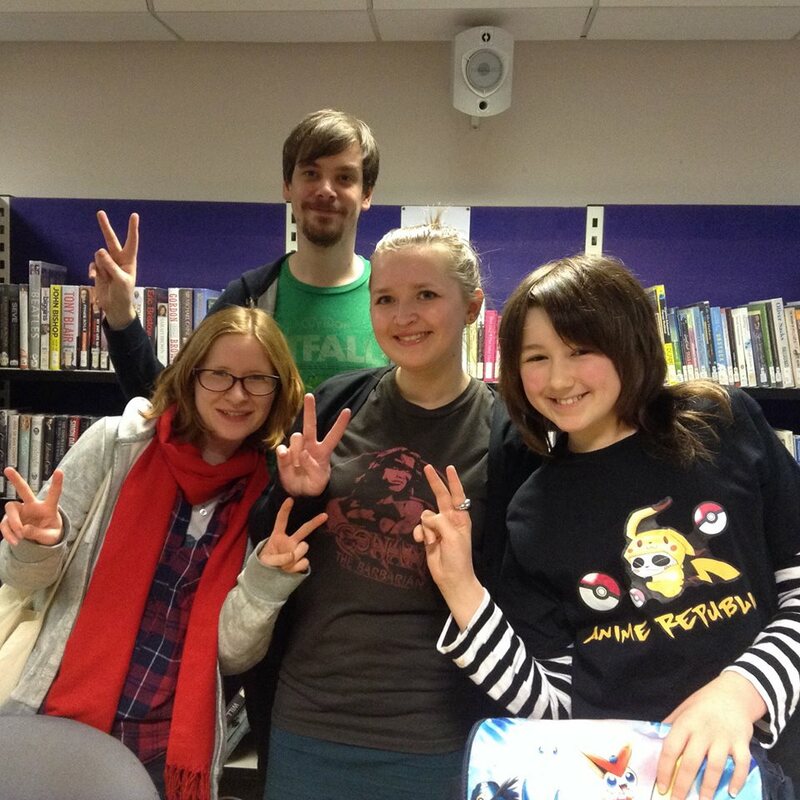 Thanks to all of the talented young people for coming along and to the staff of Kirkliston library for making it a great couple of days! 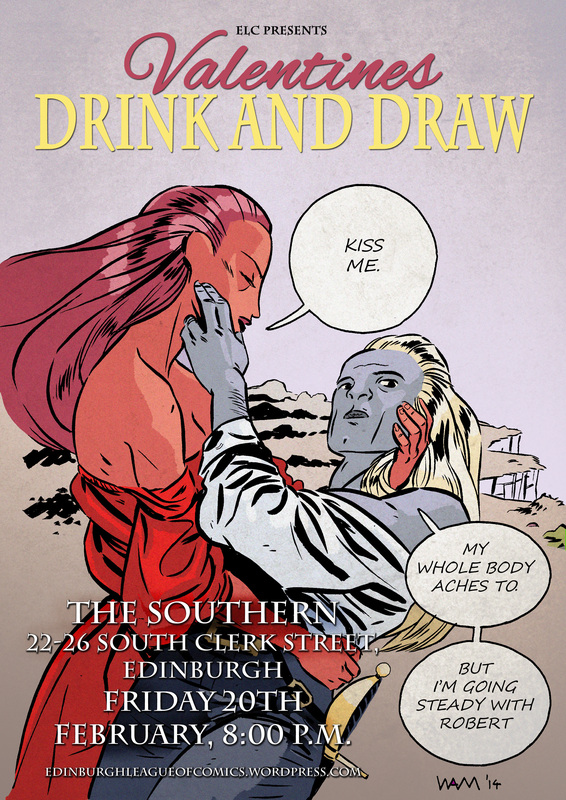 Hey, it was great to see so many of you at the Christmas Drink and Draw on Sunday night! If you want a printed copy let me know and I’ll try to bring it along to the next meet-up! The deadline for the ELC Secret Santa drawing exchange is upon us today – hope you’re all as excited as I am to see the results. They’ll be going up on the blog soon, so watch this space!